Cook and drain pasta as directed on package. Meanwhile, in 12-inch skillet, heat oil over medium-high heat. 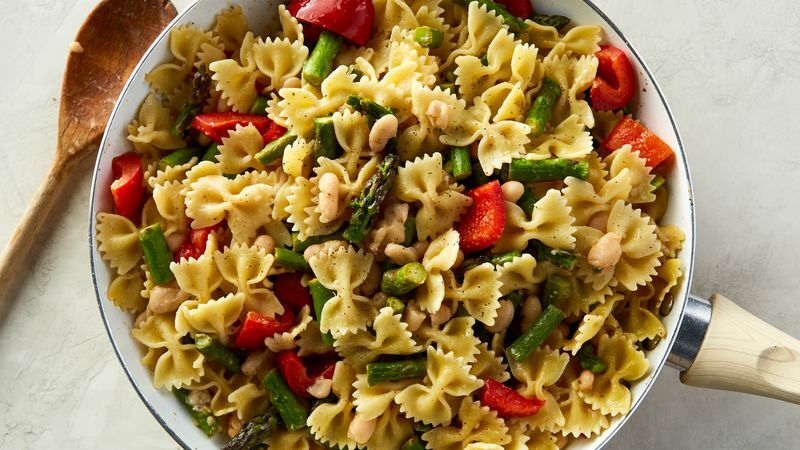 Cook bell pepper, asparagus, lemon peel, salt and 1/2 teaspoon pepper in oil, stirring occasionally, until vegetables are crisp-tender. Stir lemon juice and beans into vegetable mixture. Cook until beans are hot. Add pasta; toss. Sprinkle with pepper. Use fresh lime juice and peel instead of the lemon. For tasty Lemon Pepper Pasta and Shrimp, add 1/2 pound cooked peeled deveined shrimp with the beans in step 3. Continue as directed.